To date, guidelines don't shed much light on how clinical decision support will work. Beginning in January 2017, health care providers will be required to consult appropriateness criteria, such as those embedded in clinical decision support (CDS) tools, prior to ordering MR, CT, or nuclear medicine exams such as PET/CT to receive Medicare reimbursement. The Centers for Medicare & Medicaid Services (CMS) approval criteria will be based on criteria "developed or endorsed by national professional medical specialty societies or other provider-led entities." Beyond that, what the guidelines will look like remains to be seen. "[CMS has] taken the onus upon themselves to decide which appropriateness criteria and which guidelines will be utilized, so we're in a wait-and-see situation," says Erika Schneider, PhD, professional staff at Cleveland Clinic. To examine the state of CDS, Schneider and her colleagues undertook a study of Medicalis SmartReq and Nuance RadPort CDS systems; the study appeared in the April 2015 issue of the Journal of the American College of Radiology. Advisory panels and clinician groups evaluated the software over two separate three-month periods. Those systems were chosen because they were the only commercially available CDS systems on the market at the time. The study found significant variation in workflows, interfaces, and functionality between the systems. Schneider's team evaluated the systems based on 2,000 consecutive outpatient MRI and CT orders. Medicalis scored 60% of exams as indeterminate, meaning that there was insufficient information to make a recommendation, or not validated, meaning that there were no guidelines available. When these exams were excluded, Nuance scored 80% of exams as appropriate vs 51% for Medicalis. Nuance also predicted insurance outcomes at a higher rate, 76% vs 58%. When Medicalis' indeterminate and not validated results were combined with high- or moderate-utility categories, there was little difference between the systems. The biggest difference between the systems was how exams without relevant guidelines or with insufficient information were handled. Nuance augmented published guidelines with information about clinical best practices, while Medicalis asked for more information and utilized popup windows. Schneider says this difference in interfaces had the most significant effect on clinical decision making and patient outcomes. Willingness to use CDS was strongly affected by the number of interface screens that were needed and the completeness of indication choices. Cleveland Clinic had been considering adopting one of the CDS systems but chose not to. "Part of the reason behind that decision was that people were uncomfortable and frustrated with getting, 'No,' instead of positive guidance," Schneider says. "That was one of the learning points." The study found that less than 0.8% of high- or moderate-utility exams were denied reimbursement; the common perception is that even appropriate exams are difficult to get approved. The study also found that 19% of low-utility exams were reimbursed. Schneider says the reason for the relatively high number of approvals for low-utility exams may be that the CDS systems did not have as complete a picture of patients' health status as did the insurance companies, or that the insurance companies aren't reviewing orders as stringently as most people believe, but Schneider says she suspects the former. Schneider says a more complete patient health status presentation is one of four factors that will need to be addressed to make CDS a useful tool. To do that, it will be necessary to make pertinent information from the EHR available when radiology exams are ordered or interpreted. Schneider notes that it's difficult for radiologists to render a diagnosis if they don't know what they're looking for. Another important factor is the need for positive guidance. Schneider says CDS needs to be positive and proactive to be effective. Otherwise, people won't use it. Of course, positive guidance relies on a complete set of clinical guidelines, which is the third factor. Even if the guidelines aren't appropriateness criteria published by major societies, Schneider says there needs to be some sort of clinical best practices to augment them. Without useful guidelines, user frustration leads many to forgo CDS. Schneider thinks it will be challenging to make guidelines available at the point of care, which is essential to encourage CDS adoption. Unfortunately, complete guidelines do not yet exist, because they require evidence-based results, which is the fourth factor. Schneider's study found that 60% of ordering circumstances don't have adequate publications supporting their practice. 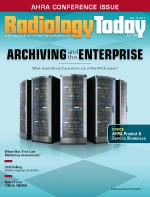 She adds that radiology professionals need to work with colleagues to ensure that additional appropriateness criteria and evidence-based medicine is developed and validated for radiology practice. Without clinical evidence, it will be difficult to develop CDS. Many are wondering how CMS will determine the guidelines that govern it. "Decision support is basically implementing clinical evidence and, if the clinical evidence hasn't been developed, it can't really be implemented," Schneider says. "I think it will be an interesting upcoming year."